If you have Relapsing Remitting MS, with 2 relapses in the past 2 years, and walk without a stick, then it’s important to know about this. Alemtuzimab, ( called Campath whilst being trialled at Cambridge for many years,) is a powerful immunosupressant, ( like chemotherapy), which is given as an IV infusion, has been shown to be very effective in stopping relapses and disease activity in MS – including progression of disability, as long as it is given before disability sets in. In a trial of Alemtuzimab reported in 2008, compared to interferon beta-1a, alemtuzumab reduced the risk of sustained disability by 71%. There was also improvement of disability scores in the treatment group. After 36 months the mean disability (EDSS) score in the alemtuzumab group had improved from 1.9 to 1.51 while that of the interferon group worsened from 1.9 to 2.28. After 5 years, those who had had alemtuzimab had 67% less disability, and 72% were relapse free, compared to 41% of the interferon treated group. This makes it much more effective than the current disease modifying treatments ( DMTs), which can show reduction in relapse rates, but not prevention of progression. 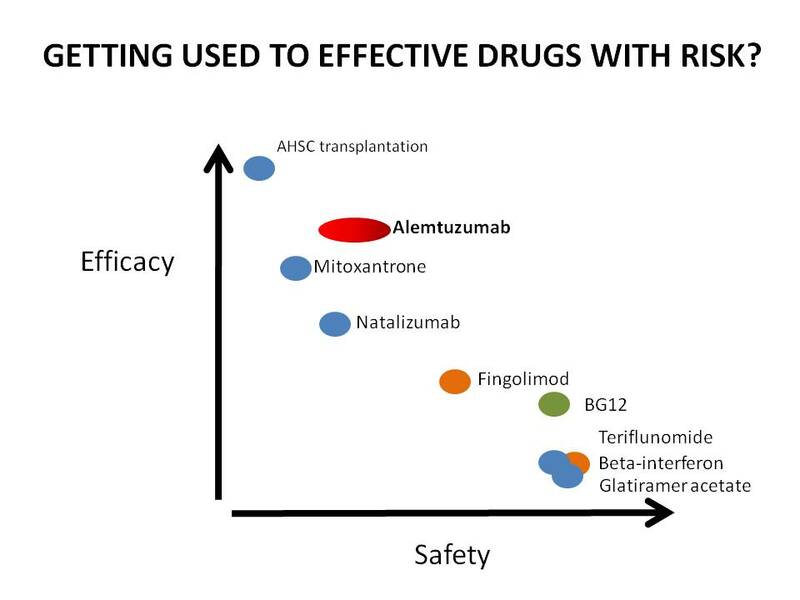 This slide, from Neurologist Joanne Jones, at Addenbrookes, shows the placement of current drugs ( including stem cell treatment) in relation to efficacy ( effectiveness) and safety. If you can see this, stem cell is at the top on the left, indicating highly effective when it works, but risky. DMTs are at the bottom on the right – safe – but not so effective as the newer agents. Nataluzimab is the generic name for Tysabri. It also has more risk of serious side-effects than DMTs, so weighing up your risk of serious disability from MS against risk of contracting rare but serious side-effects, needs to be thought about very carefully. So what are the risks of treatment? About 30% of people treated with Alemtuzimab get a different auto-immune problem at some point after treatment, and this is generally a thyroid problem, which can be treated. About 1 in 100 develop a blood clotting disorder, ITP, which can be treated if caught, but one person has died. In trials on Alemtuzimab, there was one death from lymphoma which may have been related, and there have been rare but potentially fatal kidney problems. At present Alemtuzimab is going through the licensing procedure. Once it has been licensed, it may be rationed, and only offered to those who have relapsed on the normal DMTs. http://www.colescambridge.org.uk/trial%20participation.htm, and if you are seriously interested and meet the criteria, you can discuss the pros and cons with one of the doctors running the trial, at Addenbrookes, after referral by your GP or MS Specialist Nurse. It may be worth reminding your GP that there is not a cost to them for this referral or treatment, as the trial has its own funding. Worth very serious thinking about.